Following a Memorandum of Understanding regarding implementation of the iSTEAM Programme in The Philippines – signed last year between The Israel sci-Tech Network, The City of Davao in The Philippines, and the Pass It Forward Foundation, and overseen by The Israeli Embassy in The Philippines – a delegation of ten educators from Davao will visit Israel this November, looking forward to realize the implementation of the iSTEAM Programme and other interdisciplinary programmes, devised by Israel Sci-Tech Network’s R&D and Training Center, in Davao’s education system. Davao, the third largest city in The Philippines, is home to some two million residents. This is also the hometown of the current President of The Philippines, Mr. Rodrigo Duterte, who was the city’s first elected mayor. Davao is the commercial center of the southern Philippines, a developing country with over 100 million residents, over half of whom are under the age of 21. A major portion of the many changes occuring in The Philippines as a whole, and in Davao in particular, is taking place in the educational arena, in order to equip the next generation of citizens for their country’s ongoing transition from agricultural economy to one based on industry and services. 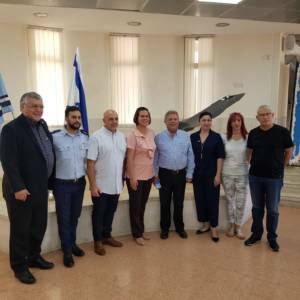 The delegation, comprised of two school principals and eights senior teachers, will take part in a unique course on Educational Innovation devised by Israel Sci-Tech Network. The course will highlight three main topics: advanced learning spaces, innovative teaching methodologies, and interdisciplinary study programmes which harness those cutting-edge learning spaces and methodologies to attain new achievements. The course will focus on interdisciplinary study programmes developed in Israel Sci-Tech Network’s R&D and Training Center: iSTEAM, Cognitive Neuroscience, “Heart of the Matter” (a cardiac science programme), and the Sci-Tech Makers programme. The course will emphasize innovative learning methodologies, such as ICT and mobile learning, along with some ‘soft skills’ related to teamwork, ongoing learning, and peer assessment. During their course, the visitors will visit Sci-Tech Network schools in order to observe the advanced learning spaces, to get an overview and a taste of the innovative study programmes, and above all to meet the teachers and the students who teach and learn in these spaces, using these programmes. This forthcoming visit was preceded by a preliminary visit of a Philippine delegation headed by Davao City Mayor, Ms. Sara Duterte, who had then paid a visit to Sci-Tech Aviation and Space High School in Ma’ale Adumim, and was very impressed by the work being done there. 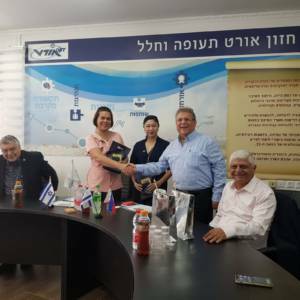 That delegation was accompanied by Dr. Effie Ben Matityau, the Israeli Ambassador to the Philippines, and by Mr. Shmuel Weiss, Chairperson of the philanthropic foundation Pass It Forward.